Barchester Towers is the second of the "Chronicles of Barsetshire" trilogy. It can be read as a stand-alone, although there are occasional references to previous characters, events and places. Wikipedia, in all its wisdom, says that Barchester Towers, “among other things satirizes the then raging antipathy in the Church of England between High Church and Evangelical adherents.” The truth is that just by reading this I wouldn't be too tempted by the book, and it would be my loss. As someone raised in a almost 100% roman catholic country, the inner workings of the Church of England, with all its branches, are still a mystery to me, no matter how many British classics I read. It was only during my bookclub's discussion that I realize some subtleties of religious conflict in the book had escaped me completely. 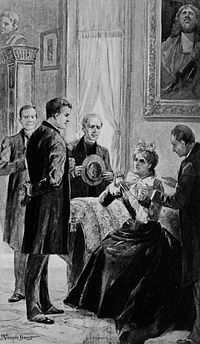 The plot of Barchester Towers in general didn’t do much from me - sleepy cathedral town, old bishop dies, everyone expects his son to succeeds him but someone else gets the post, new and ambitious people arrive, rivalries ensue, some people fall in love, others try to get rich by marriage, lots of misunderstandings. It’s as much a comedy of errors as it is a comedy of manners, and most of it revolves around the fight for primacy in the diocese between the Bishop's wife Mrs. Proudie and his chaplain, Mr. Slope. There's also a somewhat meh romantic story in the background. What did do it for me was the characterization, social commentary and the wonderful wit. Is there a “satire of manners” genre? If there is, Trollope is its King. He manages to craft characters that have everything to become caricatures, but still feel like someone you’ve met before. There’s Mr. Slope's shameless ambition and sleazy ways, Mrs. Proudie teeth-gritting bullying of her husband and, best of all, the Stanhope family. Dr. Stanhope, went to Italy to treat a “scratchy throat” and, after 12 years (!) of peacefully fishing on the shores of Lake Como, returns at the command of the new Bishop. One of his daughters is the "Signora Madelina Vesey Neroni" (née Madeline Stanhope) and her daughter, “the last of the Neros”. Mrs. Proudie looked at the Signora as one of the lost. One of those beyond the reach of Christian charity, and was therefore able to enjoy the luxury of hating her without the drawback of eventually wishing her well out of her sins. And here the author must beg it to be remembered that Mr. Slope was not in all things a bad man. His motives, like those of most men, were mixed, and though his conduct was generally very different from that which we would wish to praise, it was actuated perhaps as often as that of the majority of the world by a desire to do his duty. He believed in the religion which he taught, harsh, unpalatable, uncharitable as that religion was. One of the most intense points of discussion during my bookclub was about why Trollope has become more forgotten (or isn't as popular nowadays as) Austen, the Brontës or Hardy. His writing certainly deserves it, yet Barchester Towers, his most popular novel, only has 2.360 ratings on Goodreads, compared to Tess of the D'Urbervilles’ 49.219, Agnes Grey’s 8.101 and Northanger Abbey’s 63.332. We didn't reach any conclusion, so I'd love to hear your views. Is it the lack of a convincing/passionate romance? Is it the focus on the Church of England issues that limits it? Another recommendation: BBC's adaptation, with Alan Rickman as Mr. Slope. Barchester Towers and the full Chronicles of Barsetshire (The Warden and The Last Chronicle of Barchester) are available on Project Gutenberg.